It is a machine mounted on the rear three-point hitch tractor. The drive is provided via a cardan with overload clutch set on torque 1600 Nm, which is blowing in case of insert too strong branch. 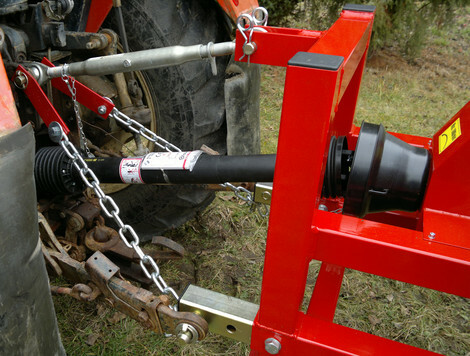 The overload clutch protects tractor and branch logger against overload. The cutting knives feed branch itself during running machine. Chips then fall into a bag mounted on a double bags-filling device. After filling the first bag is no need to interrupt work due to full bag, because you can just flip the flap and the chips fall further in the second empty bag. During the filling second bag, the operator can replace a full bag by empty one. During the continuous input branches can be filled one bag in 10 seconds, so performance is highly dependent on the operator, especially on the speed of operation when are bags changing. 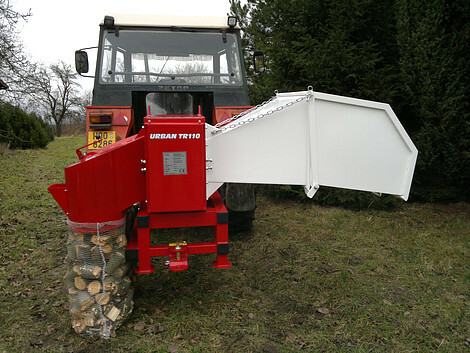 The branch logger is equipped with a hinge for connecting with the trailer of a maximum weight of 2000kg, which could be filled by full bags. The optimum number of persons to operate with branch logger in forest is 3 persons (one and only changes and loaded bags on trailer). Raschel bags are used with size 57 × 104 cm. Customer will get with machine 50 bags for free of charge. The maximum diameters of branches or small trees are valid only for inserting one piece. If branches are thinner, you can also put them more at a time. The minimum recommended tractor power is 50hp. Optimum performance is a 70hp of tractor power. Tractor with this power can work at lower speed (RPM about 1300/min of the engine). Size of the tractor must be proportionate to the weight of the branch logger, which is 650 kg. Alternatively, the tractor must be imported at the front. PTO is included in the 1000 rpm speed (it can also be included to 540/min, but at low speeds the feeding of branch works worse). Drive of branch logger is through the gearbox with oil filling. The surface is painted by powder coating (Comaxid). 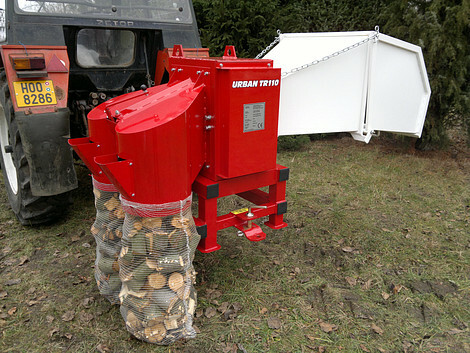 The hopper of branch logger consists of a stableand tipping parts. 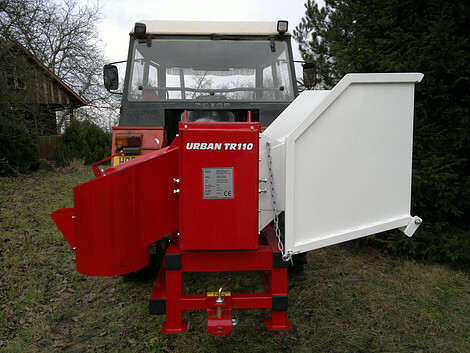 The tipping hopper ensures a small width of the machine in the transport position. The width of machine does not exceed the width of tractor, which is important for a ride in the forest through the trees. The hopper is extended in the working possition thanks to tilting of the tilting hopper part. Extended hopper ensures better flow of branches and operator safety. The hopper is oriented horizontally, which greatly facilitates the insertion of long branches, compared with a vertical or oblique hopper. The branch logger is raised to the tractor hydraulics still at the same working height (not lay on the ground) during chipping or transportation. The optimum working height is when the lower edge of bags-filling device is 80 cm from the ground. The securing chains are used to ensure machine in this position. These chains are supplied together with the branch logger. The chipper device operates on the principle of two shafts with knives which are rotating in opposite directions. Pitch diameter of knives is 224 mm and the through gap between the shafts is 120 mm. 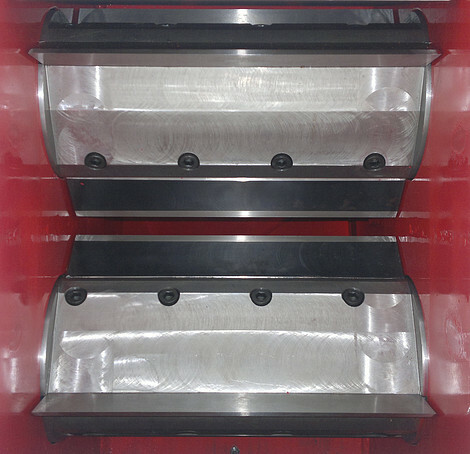 The chipper knives are inserted into grooves in the shafts. Each knive is attached by four screws. The knives are made from tool steel and can be re-sharpened. The knive is supported by a pad after each sharpening. There must be a small gap (maximum 0.3 mm) between knives. The knive can be ground down to about 4 mm. Knives can produce more than 1000 pcs of bags on one sharpening. It depends on quantity of impurities (clay, stones, …).